We take an in-depth look at the world's fastest Subaru WRX! Currently the world’s fastest WRX! With 14 second quarter mile performance outa the box, the Subaru WRX’s performance reputation is built on solid ground. Add a collection of aftermarket bolt-ons and you can crack the 12s without too much hassle. This begs the question – how fast can you go? In this article we’ll give you a technical run-down of this record-breaking King of Rexes. 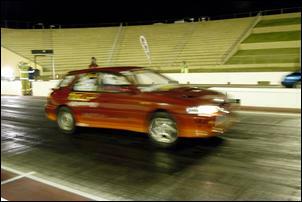 The vehicle credited with that 8.88 second pass is a 1999 Subaru WRX wagon. Why a wagon, you ask? "Well it was there when we needed it and the previous owner had already put a cage in it," says TRP’s Domenic Rigoli. A quick check of Subaru’s official data reveals the wagon weighs about 35 kilograms more than the sedan version – a relative disadvantage, but it’s nothing a few more horsepower can’t fix! When we photographed the car it stood out in the staging lanes thanks to its graduated orange/red paint job, stickers, M3 style driver’s mirror, STi fog light covers and rear parachute. Not long after we snapped it, however, the body was further stripped down and resprayed – more on this later. So how much power does it take to run an 8.88 pass? "I’m not game to hit the nitrous on the dyno," laughs Domenic. The platform for this monstrous power production is an early Liberty (Legacy) EJ20 closed deck block. TRP begins by cramming it with custom sleeves, which are essential from a strength and durability point of view. A long-throw crankshaft also increases the engine’s swept capacity to around 2.5 litres. Inside the sleeves slide Venolia forged pistons providing a static compression ratio of 8.0:1 (the same as factory). 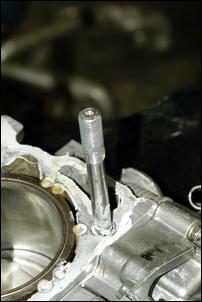 Custom rods, ARP bolts and nitrided bearings are also in service. The block is equipped with O-rings to help seal copper head gaskets. However, one of the key changes in this area is the move to meaty 14mm head studs. 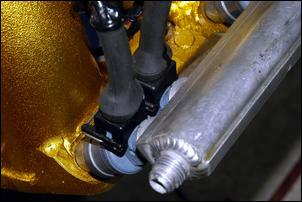 These prevent the heads lifting, which is common when pushing the engine with its standard 11mm studs. The DOHC, 16 valve heads are from a ’99 WRX and feature mild port work, stainless steel valves and custom valve springs. These uprated springs prevent valve bounce that might otherwise be caused by the custom high-lift camshafts, which are tuned using JUN adjustable sprockets. 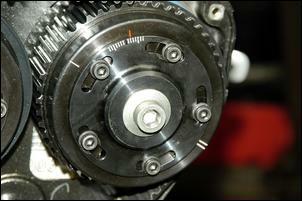 A high-strength Kevlar cam belt is used. Engine durability is enhanced thanks to an extended sump (providing about 8 litres of oil capacity) and a breather catch can. The TRP guys have experimented with various exhaust manifold and turbo configurations but that magic 8.88 was achieved with a custom steam pipe manifold locating the turbo in front of the engine. This allowed the use of shorter exhaust runners. 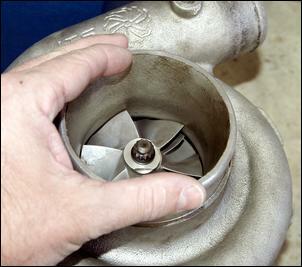 And the turbocharger? It’s an Innovative T76 roller-bearing unit teaming with a Turbonetics 42mm external wastegate. The exhaust system is a muffled 3½-incher. Up to 40 psi of boost is put through a large Mood Motorsport air-to-air intercooler that’s mounted in the bumper’s main cooling aperture. Note that the forward positioning of the turbo and intercooler meant there wasn’t enough room to fit the standard radiator in the nosecone – the engine now runs a Mood Motorsport radiator that’s mounted on brackets above the engine. Twin aftermarket thermo fans are fitted to the radiator core. Interestingly, the wagon runs two Ziex nitrous kits. The primary kit gives a 50 horsepower shot immediately upstream of the throttle body to aid launching. The secondary kit then delivers a 100 horse shot through a fogger mounted a bit further upstream in the post-intercooler pipe. This is manually activated via a dashboard switch when the car is cleanly away. 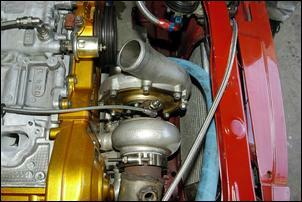 The intake manifold is the humble ’99 WRX item with the standard throttle body. 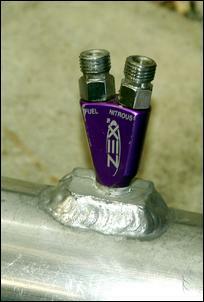 Note that the manifold is reversed to give a shorter, less restrictive induction route. 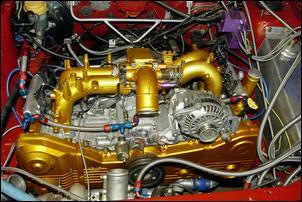 Look closely and you’ll also see the intake manifold has been modified to accept twin injectors per cylinder. Fuelling the engine are eight 1750cc methanol injectors suckling from custom rails. 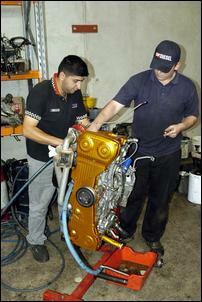 Methanol flow is provided by three Bosch Motorsport pumps drinking from a custom tank inside the engine bay. 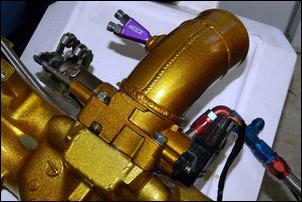 Twin Malpassi fuel pressure regulators are also employed. Controlling the fuel system is a MicroTech LT8 programmable management system. This also takes change of the ignition arrangement, which comprises twin MSD boosters. The rev limit is set just over 8000 rpm – we’re told the engine makes good power to around 7900 rpm. Talk to the owner of a fast WRX and you’ll invariably hear a story of driveline destruction. TRP have vaporised their fair share of Subaru driveline components but believe they’ve now got a pretty good set-up. In previous configurations, a dog gear version of the Subaru 5-speed manual was used, but the requirement to dump the clutch off the line proved too much for the CVs, shafts, diffs and transfer case. 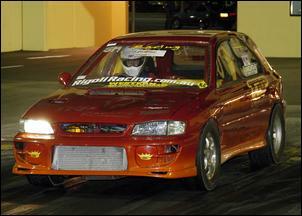 These days, TRP uses a tricked Subaru auto that is much gentler on the rest of the driveline. Understandably, the guys don’t want to give out too much detail in this area but we can tell you that a B&M shifter and 4500 rpm stall converter are part of the package. Interestingly, the troublesome centre diff has also been replaced with a billet shaft – this results in greater strength and a constantly locked 50:50 front-to-rear torque split. Domenic Rigoli tells us that compared to the manual ‘box, the auto trans does rob power, but it more than makes up for it in reliability and off-the-line acceleration. The auto set-up has achieved an impressive 1.33 second 60 foot time, which is better than they ever saw with a manual dog ‘box. Another hurdle has been the strength of the factory rear-end. After breaking a few rear CVs, TRP converted to a Holden Commodore VL Turbo diff and accompanying shortened axles. The Holden’s solid axle is located by a custom ladder bar arrangement and a 3.7:1 mini-spool centre has been inserted. It’s been a lot of work but there have been no problems with it so far. The standard WRX axles are also lasting okay up at the front. While we’re crawling around near ground level now is also the time to tell you the car runs the standard VL rear disc brakes together with WRX front discs. The suspension arrangement is fundamentally standard, except with adjustable King front coil-overs and SPAX rear coil-overs. The rear coil-overs are mounted further inboard than standard to accommodate a big set of rear tyres. Despite its all-wheel-drive traction, the TRP wagon can erupt with wheelspin when the nitrous is pumping, so slick front and rear tyres are used. 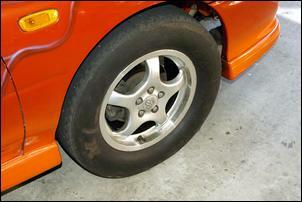 At the time of photography, these were mounted on Enkei front and steel rear rims. The rear tyres are as wide as will fit. The TRP wagon is not used as a street vehicle, so there were no reservations in stripping the interior down to a bare minimum. All trim and carpet have disappeared and a gutted early model WRX dashboard has been installed. The dash now houses an AutoMeter monster tacho, a 100 psi pressure gauge (used to read boost), oil pressure gauge, TurboSmart boost controller, MicroTech ECU handset and a MicroTech wide-band air-fuel ratio meter (with a probe mounted in the front section of exhaust). 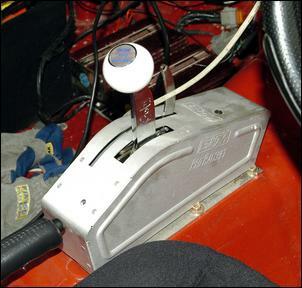 There is also some basic switchgear, including the switch for the secondary nitrous injection and a lock-out for the rear-driveline – this allows a front-wheel burnout before making a pass. Not that this makes a major difference to ETs. The battery is also mounted inside the cabin since there isn’t room under the bonnet. 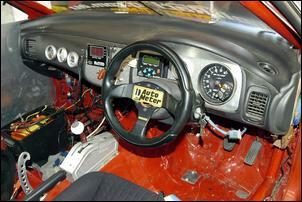 Oh, and a Momo wheel, race seat and harness complete the insides. Note that the MY99 dual airbags have been removed to save weight. As you see it, we’re told the car weights about 1100kg – around 200kg lighter than standard. After running the 8.88/154 mph pass, TRP are now in the early stages of a major vehicle revision. Interestingly, the guys are now running Impreza 2.5 SOHC heads, which apparently have the same size ports as the quad-cam EJ20. Dominic says they also use a roller rocker arrangement, which should be more reliable than the shim-type set-up in the EJ20. TRP has also ditched the intercooler and swapped to a direct-port nitrous system. The idea is to let the nitrous and methanol take care of charge-air cooling. At the time of writing, the guys are yet to achieve the same power output seen with the previous set-up but are confident of getting close with some fine tuning. Quarter mile times are also likely to tumble thanks to an even lighter kerb weight. Since our photo shoot, the car has been lightened with bare door and tailgate skins, the spare wheel well was cut out, an aluminium bonnet was fitted and Weld racing alloys were installed. The SOHC heads and removal of the intercooler will also help shed kilos – Domenic suggests the car now weighs about 1000kg. "We’re trying for mid to low 8s," says Domenic.